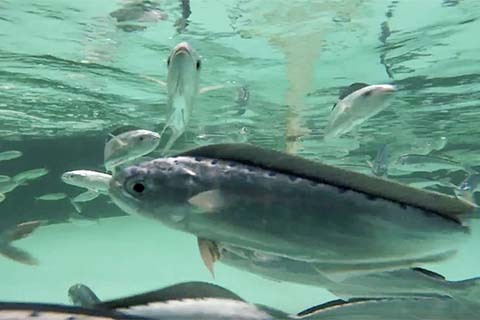 Over the past decades the UM Aquaculture Program has worked with a variety of recirculating aquaculture systems (RAS) farms and equipment manufacturers around the world. The UMEH facility has a variety of RAS systems on site, most of which are used for broodstock maturation and spawning. These systems have the ability to be temperature controlled, allowing for volitional spawning to be induced. While most of the RAS technology on the market today is designed for use with commonly cultured species such as salmon, trout, and tilapia, the UM Aquaculture team is conducting research to optimize RAS systems for use with high-value marine fish such as grouper, snapper, mahi-mahi, pompano, and flounder.